There are many websites that have virtual sticky notes that can help your students and class brainstorm and share ideas with their classmates. 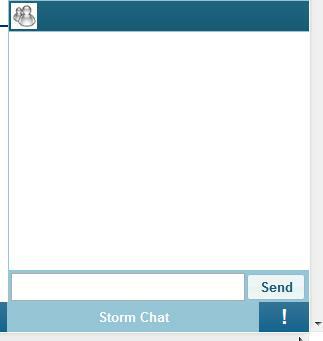 Edistorm has done a fantastic job, going the extra mile to make virtual sticky notes even more awesome. 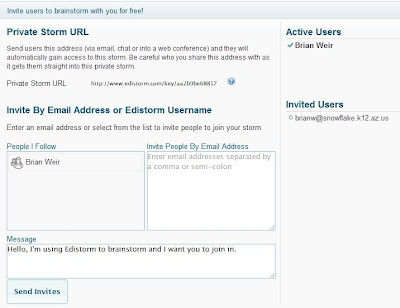 What are some advantages of using Edistorm? Students can vote on ideas. You can add video and images to your sticky notes. Many templates to choose from. You can export your document to PDF and get reports. 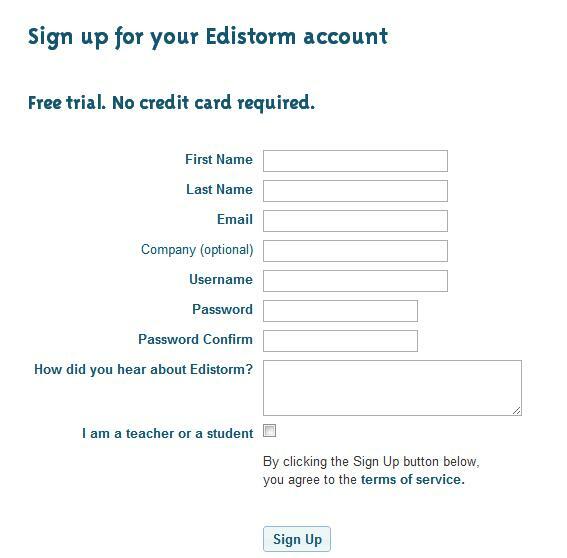 What are some disadvantages to the Edistorm? I didn't find a "Zoom" out option and because the size of your sticky board I think that it would be nice to have. Here is an introduction to the site via Youtube. 2. 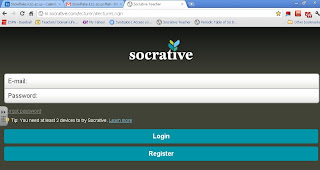 Click on the "Sign Up" link at the top if you are new or the "Login" button. 3. 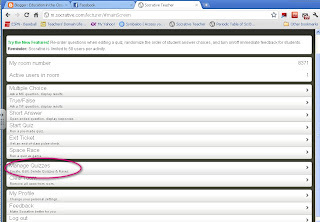 If you are just registering, fill in the information and then click the "Sign Up" button. 4. 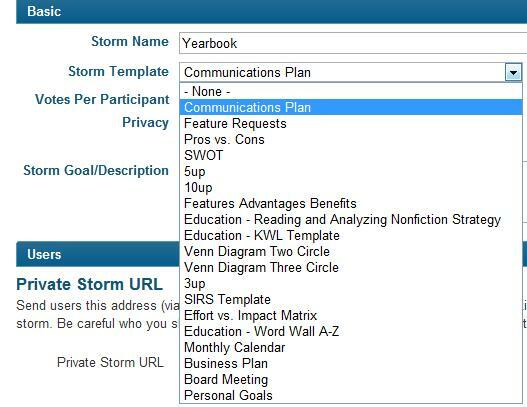 Once you are signed up, click the "Create New Storm" button. 5. 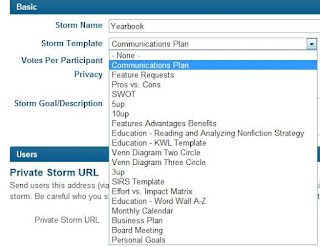 Give your storm a name, choose a template to work with, decide how many votes each student will get for the choices that will be made, and then give your "Storm" a description. 6. There are many templates to choose from. Select the one that works best for your project you are working on. 7. 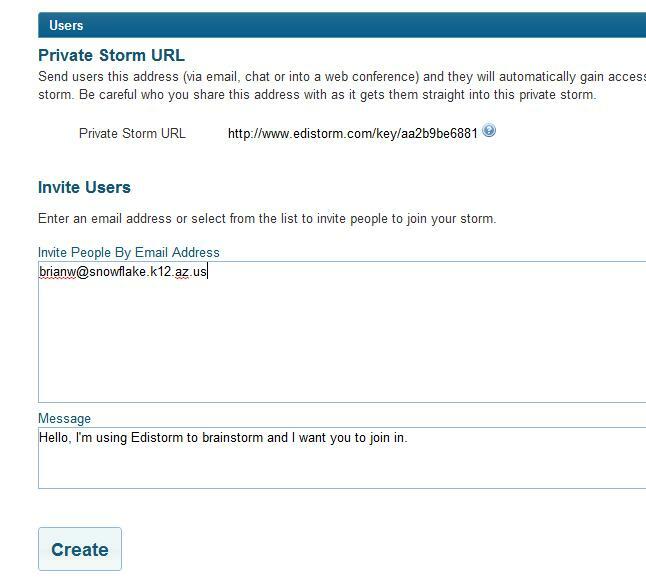 You can send an email out to anybody you want to invite to your "Storm," but since most students don't have email, just give them the link to your storm. Also you can use URL shorteners that are more user friendly and easier to type. Click the "Create" button to get started. 8. To the left you will see your sticky notes and colors. Just start typing and then click the "Add Idea" button. You can change to color of the note as well by clicking the colored squares. 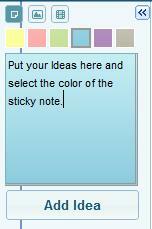 Remember that your students will also be allowed to create their own sticky notes as you discuss your project. 9. 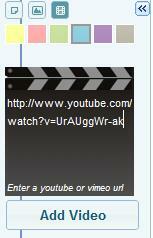 You can also click the "Image" icon or the "Movie" icon so that you can upload images or link to Youtube videos. 10. Just past the Youtube URL into the Movie box and click the "Add Video" button. 11. 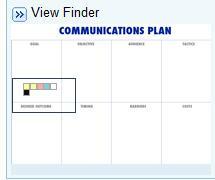 Now your whole plan is bigger than your monitor so to the right of your screen you will see the whole plan. Just drag the square around to the section that you want to detail. 12. Dow at the bottom left you will see your "Legend." Just click on each word of the legend and you will be able to change the color name to any name that you want. I did that for the color yellow, which I named "Sports." 13. If you want to share your sticky note board now you can click the "Invite Users" button. 14. 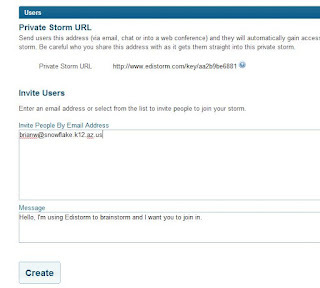 You can change the email message here, add email addresses to the list, or get your "Storm's" URL. 15. 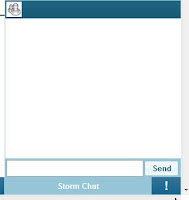 At the bottom right of your screen you can also open up a chat window and virtually discuss the notes together. 16. This is kind of what the sticky notes look like. You and your students can vote on the ideas by either dragging the "green dots" onto a sticky note or you can just click the box with the number in it. 17. On your sticky note you can click the "Comment" button and comment on each other's posts. 18. 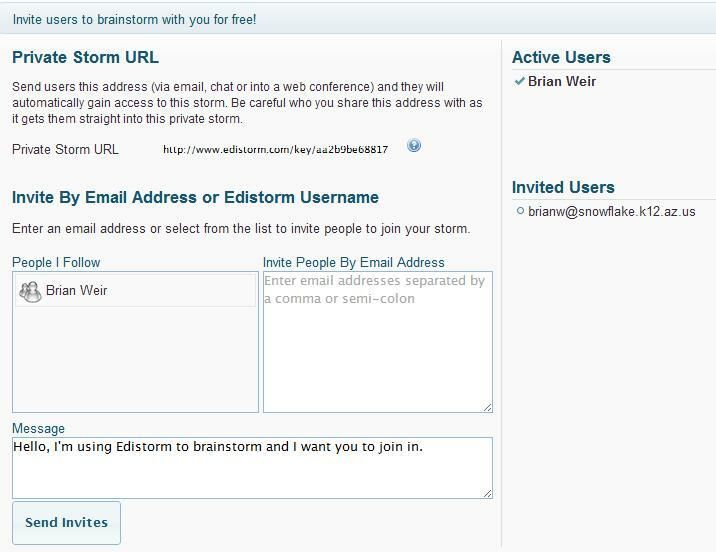 One of the nice things you can do with Edistorm is print off and save your "Storm." 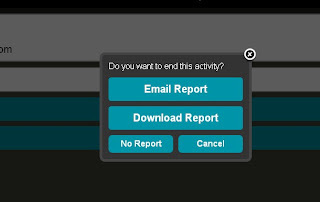 Just click the "Reports" link at the bottom left corner of the program and you can then choose which type of report you would like. 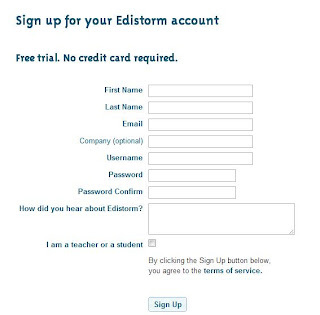 That is all there is to using Edistorm. Here is my link so that you can play with my "Storm" and give it a try. There are certain emails that I need to send out as reminders to some of my staff and sometimes I forget to send them. Not that they really want to read all that I send anyway, but some of my emails are important; of course I believe that they are all important. Also there are times that I want to send an email out, but know that if I send it too early, the recipient might forget and when I decide to wait to send it out, I forget. So what is the solution? Microsoft Outlook allowed the user to assign a date as to when a particular message would be sent. I looked all over Googles help sites and couldn't find any indication that they were working on a Gmail alternative. Therefore I turned to Chrome Extensions to see if I could find a solution and the result was favorable. Today I would like to high light an excellent Google Chrome extension called: Boomerang. Boomerang allows you to pick a date and time to send messages. It is very simple to use. It adds an extra button to your Gmail that says Boomerang. Click on it and it will ask you when you would like the message sent, date and time. This extension also allows you to receive a message back if you don't hear a response from somebody after an allocated time frame. 1. Make sure you are in the Google Chrome browser. 2. Click on the "wrench" icon. 3. Choose the "Options" option. 4. 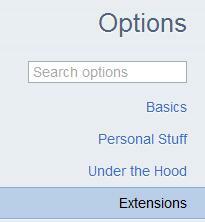 Click the "Extensions" tab under the "Options" section found on the left side. 5. Click the "Get more extensions" link. 6. Type in the search box the word "Boomerang." 7. 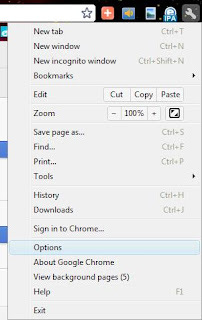 Click the "Add to Chrome" button next to the "Boomerange for Gmail" extension. 8. 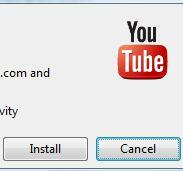 Click the "Install" Button. 9. Now you have Boomerang installed. Tutorial on how to use Boomerang. 1. Click the "Compose" button from within Gmail to compose a new message. 2. You will now see three new features added to your "Compose" message pages. A "Boomerang" drop down menu next to your login/logout at the top right corner. A check box with a couple of options. 3. The "Send Later" button is the most important and useful to me. It allows you to choose the time at which you would want your message to be sent. 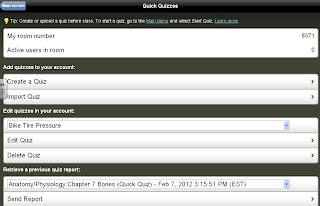 You have many options to choose from or you can just manually add a very specific time and date. Once you have chosen, just hit the confirm button. If you send out "Reminder messages" that are always the same and you send them out on regular intervals, then you can click the "Schedule recurring message" option. 4. 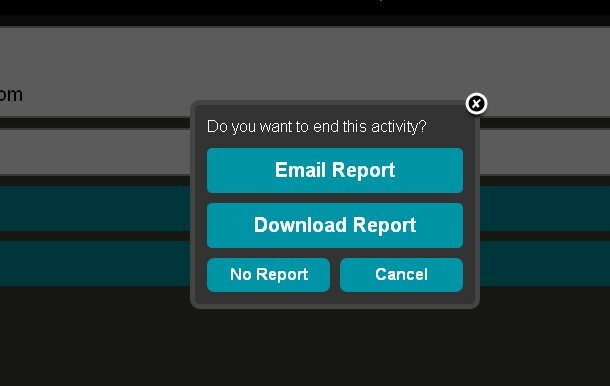 The "Boomerang" drop down isn't really useful and is more of a sales pitch. 5. The "Boomerang this message" option lets you tell your message to message you if you never heard back from the person you sent your message to. Kind of cool. 6. 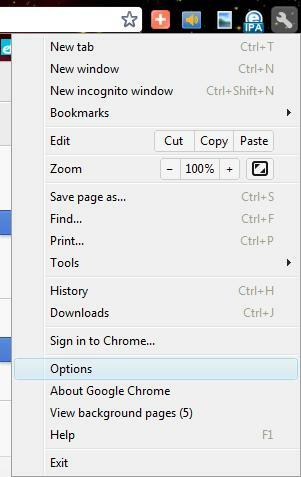 Well that is all there is to using Boomerang, another useful Chrome extension. 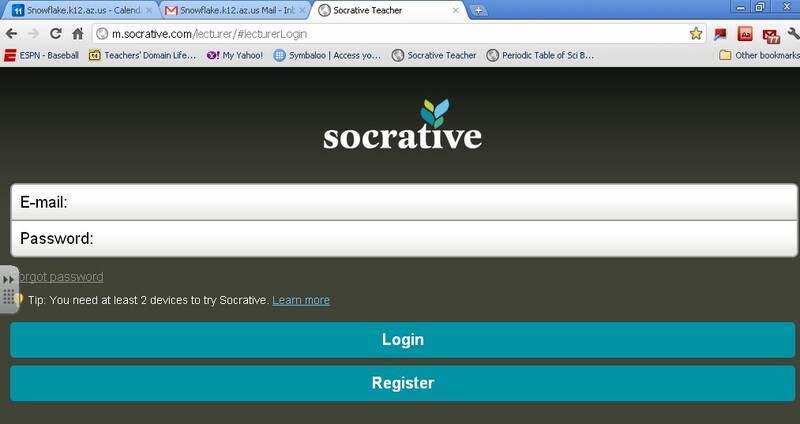 Using Socrative to help students practice writing. The Common CORE of academic standards is coming down the pike. Students need to practice their writing skills in all classes in order to meet these new literacy standards. 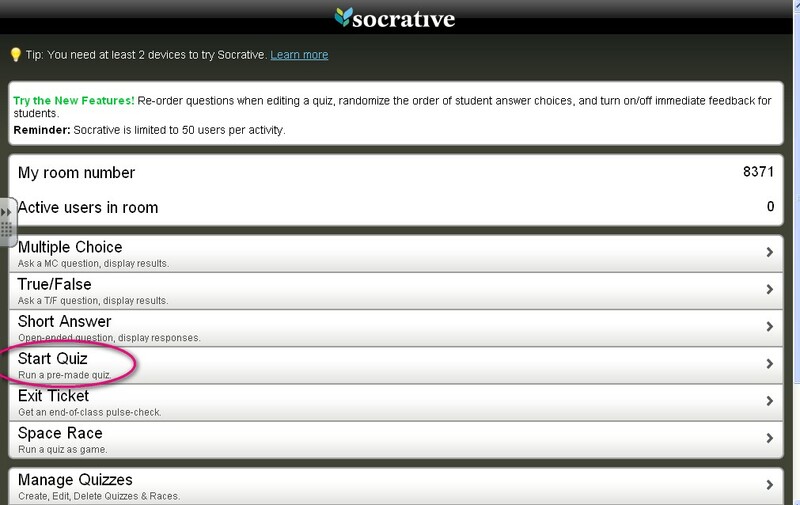 One way to do this is by using Socrative. 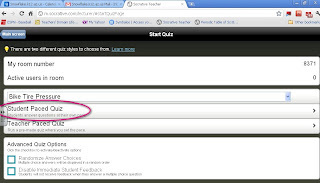 A teacher can put one short answer question in a quiz and have students take the quiz. The question needs to be one that takes at least a couple of sentences to answer. We are trying something in our science department. A couple of times a week we'll ask the students a question that takes some writing skill to answer. 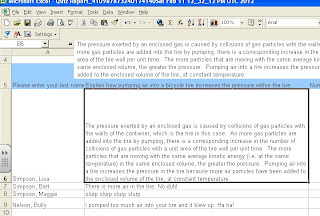 The question can have something to do with what we have studied that day or it may have something to do with an article or a textbook passage the students may have read. 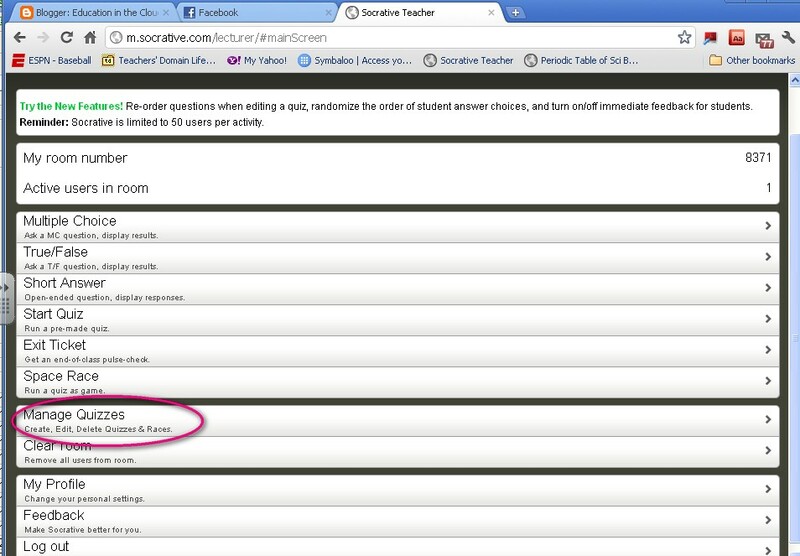 We'll have the students answer the question in Socrative. 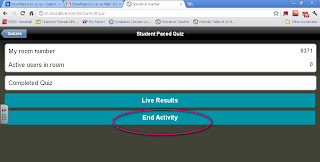 After the students finish, it is easy to get the results from Socrative and have an electronic record (or print record) of what the students have done. 2. You will need to scroll down and click "Manage Quizzes"
3. 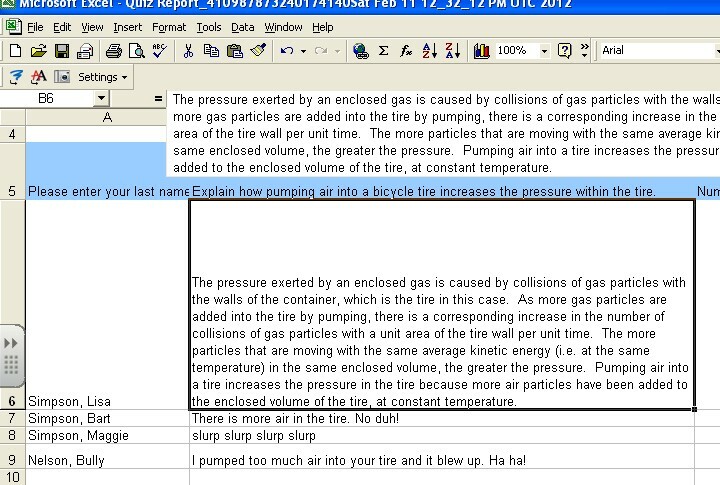 I have a quiz already entered ("Bike Pressure Quiz"). 4. 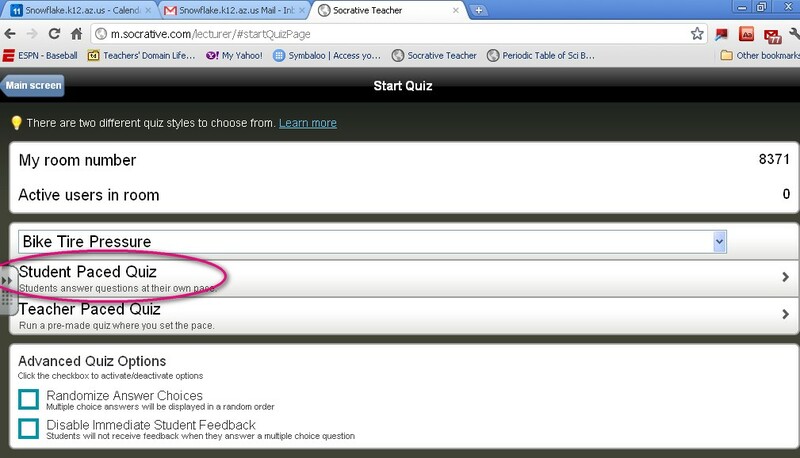 If you click "Edit Quiz" you can change, add, or delete questions. 6. After saving the quiz, you would click "Start Quiz"
7. 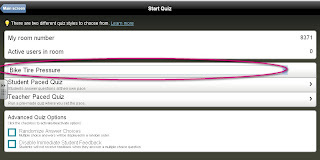 Choose the quiz you want the students to take. 9. 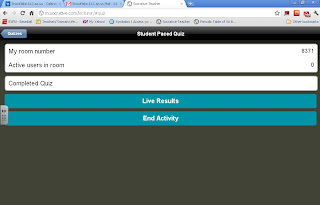 Your screen will look like this while the students are taking the quiz. There isn't a real need to click the "Live Results" tab since the students are taking a short answer quiz and not a multiple choice. 10. When the students are finished (or when time is up), click "End Activity"
11. You will be given options for your report. If you want to give the students more time, click "Cancel." 12. Your report will be in an Excel spreadsheet. The original report is shown below. You will need to do some tweaking to make it look the way you want. 13. You will need to increase the row height in order to see the entire answer for each student. You may also need to adjust the column width. You can then either save the files in a folder as the students do these, or you can print them out. Happy writing! Credit to Gregg Lunt for coming up with the idea.